KUCHING: The Penans have proved themselves to be a reasonable lot. After paralysing on-going work at the proposed Murum hydroelectric dam by erecting blockades to the site for some 10 days, they now stand ready for the negotiation table. The dismantling of the blockades came about following the intervention of Belaga assemblyman Liwan Lagang, who met some Penan leaders in Bintulu on Oct 5. 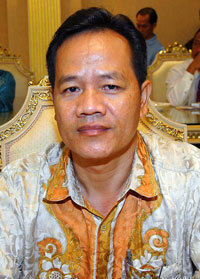 “Yes, they have stopped the blockade, but it’s not my efforts alone,” Liwan told The Borneo Post yesterday. Liwan said he was not surprised with the outcome of the meeting because he knew since day one that the Penans were “reasonable” and law abiding people. Liwan said he would hold another meeting with them soon. “I will leave the reporting to the SPU which handles the resettlement. I am only rendering my help in my capacity as their wakil rakyat. I am not in the committee,” added Liwan, who is also Assistant Minister of Culture and Heritage. The Penans from eight villages in Murum started to block routes to the dam project site on Sept 26 purportedly to protest the government’s failure to meet their demands. According to Raymond Abin, National Coordinator of the Sarawak Conservation for Natural Environment (SCANE), among their (Penans) demands were 25 hectares of land for each of the 300 families affected by the dam; RM500,000 cash compensation for each family; 30,000 hectares of land to each of the nine villages; education fund for their children; community development fund for their community; and rights to land which are not flooded (islands created) by the dam. The eight affected villages are Long Wat, Long Luar, Long Tangau, Long Menapa, Long Singu, Long Malim, Long Peran and Long Jaik, a Kenyah-Badeng village at Long Umpa. On Saturday, Raymond released a statement claiming that all major works in Murum dam had come to a standstill after the Penans blockaded an old logging track which was only passable by four-wheel drive vehicles. He had said that the track was the only alternative route to the project site, and that the number of Penans involved had swelled from 200 to more than 320. Raymond also claimed that the Penans had set up camps and built makeshift huts around the blockade site at Seping River Bridge, about 40km from the dam. However, when contacted by The Borneo Post and told that Liwan had already secured a deal with the Penans on Friday and that his statement contradicted development on the ground, Raymond admitted that he was not informed of the latest development! Land Development Minister Tan Sri Dr James Jemut Masing, when asked for his comments yesterday, said, “I always believe that the Penans in Belaga are not against any form of development. Murum Dam is the second mega-dam project after Bakun. It is located about 70km upriver from Bakun HEP which started transmitting power on Aug 6, last year. The Murum HEP project is progressing well and has a power generating capacity of 944 MW. Work on the project commenced on Oct 1, 2008. The whole project is expected to be completed by the end of next year.